Japanese Animation recreation from "DragonBall Z". Uniform made entirely from scratch except for the soles of the shoes. Forearms and grieves made from vinyl. Recycled Air Force flight helmet shell painted and assembled with found objects. 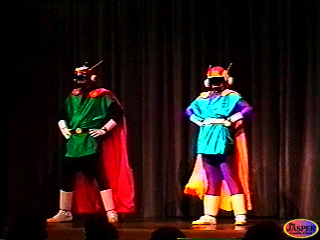 Great Saiyaman... strike a pose! 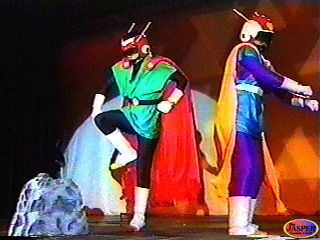 "The Hame-Kame Twins" performance at AnimeExpo 1998. 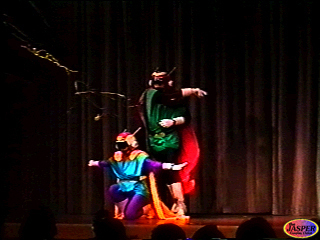 More Saiyaman antics at AnimeExpo 1998. Partners in Crime Fighting! At Comic-Con International 1998. 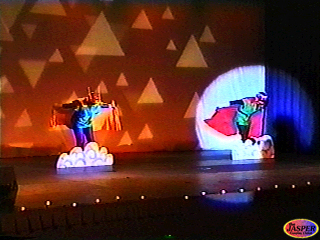 "The Hame-Kame Twins" performance at Comic-Con International 1998. Great Saiyaman successfully disembowels "The Rock!" Members of the Cosplay Mailing List gather for some quick pictures. "The Hame-Kame Twins" Copyright 1998 David Ramsay and Kimberly J. Ramsay. All rights reserved.